You crafted a world-class resume, utterly compelling and error free. You met all the employer’s requirements and possess skills far more than the basic qualifications. After having your resume parsed and nailing the initial screening, you finally have a final interview scheduled. Time to get ready, because it will be your time to shine! Confident in how you will show yourself to the employer, you are excited for the opportunity to discuss your skills, talents and enthusiasm. For it to work, you know the meeting must start off with a bang! All you need is an excellent introduction. No problem, you know what to say. You DO know what you are going to say, do you? Working on an effective “elevator pitch” means perfecting a review of your accomplishments and talents, all in the span of a couple of minutes. After some thought, you know you need a winner! A minute (or two) is all you need! A couple of minutes? When is the last time you rode in an elevator? The standard elevator trip is less than a minute; and like an elevator ride, attention spans are also just as short. Two minutes are simply too much time to “wow” your audience. The best pitches tell a story—your story—in half a minute. That’s right; you have to state your case in 30 seconds. Making an impact in an instant can be the difference between getting the job and boring an interviewer to tears. The best elevator pitches are crisp, concise and gets to the point quickly—imprinting your personal brand on the audience, whether it is an interview or a chance meeting with a potential employer. Tell the audience what you offer. Say how you will answer a specific problem. Outline the results you will give. I am a (what you do best) that can help (target audience) to (solve a problem) and (the results you will provide). The most critical aspect of a strong pitch is establishing the problem; any suitable candidate will have researched the company before the interview. Do your homework, and know enough about the company to devise a way you can help them—meaning you understand the role, and the problem you will be hired to solve. The pitch should be sincere and easily digestible to any listener; avoid technical language and jargon that talk over the heads of your audience. Like any other significant piece of brand advertising, the pitch doesn’t show all the cards in your hand. It should leave the audience wanting to know more about you, who you are and what you have to give. Granted, that is a lot to accomplish in 30 seconds, but that is the point. The job of the candidate (for now) is to solve the problem of a prospective employer—finding the best person to fill a vacancy. With an effective 30-second elevator pitch—that person can be you! 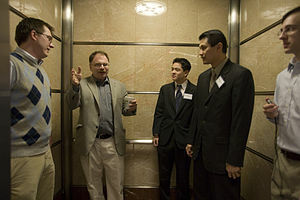 What Does Your Elevator Pitch Ask For?